Hi, could I ask why there's an "!!OR!!" before the HD texture mod in the requirements? Does that mean that we don't have to use the HD mod, because I don't really like the way it makes the faces look, and I would really like to use this morph. Oh, that's a leftover from when there was a standard definition version, but it ended up taking away Leliana's head altogether. Unfortunately the HD mod is a requirement, unless someone with greater skill than I can work out how to bring her head back. Sorry! Tried out the Non-HD Leliana, she had no head : / Just a space....and while it is the final frontier, it's a bit distressing to see on our dear Leli! And sadly, the version mor for DAO doesn't start with 'hf_genhf_', it has to be added manually. Still a good mod, just needs some TLC. Thank you for the heads up! I messed up with the file name, you're absolutely right. Thank you again! EDIT: I have no idea what's going on with the non-HD headmorph. I have very little technical skill to speak of (which is why I've only ever modded faces, guess even that isn't a safe activity) so I can't for the life of me find out what the problem would be. I tried remaking the non-HD head from the HD version over again but that doesn't seem to have worked. I guess for now I'll have to pull the non-HD version and hope that any interested party find out what's wrong. Sorry for not being able to fix it properly! 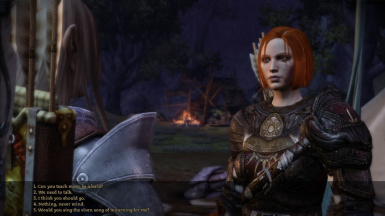 Having a little trouble getting this to work - Leliana is showing up with a shiny grey face. Can I just confirm that the required texture pack is Dracomie's True Textures, the one found in the Non-Companion NPCs folder of Dragon Age Redesigned? I installed the texture pack and no other part of Dragon Age Redesigned - was that OK? Oh shoot, I think it might require the HD texture pack to work, I didn't realise this. I'll upload one that requires only Dracomie's True Textures now, thank you so much for pointing this out to me!! I don't think anyone has a problem with very beautiful characters, just that exaggerated beauty isn't Amoonicorn's style. 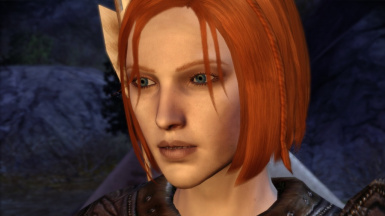 I would not say that my mod is over the top at all, it mainly normalises her features and makes her closer to her DA2 appearance. If you or anyone else wants a companion mod which has very exaggerated beautiful features, then that's fine for them, and I'm happy for them. I uploaded my mod (which I made for personal use) for people who want to keep her facial features consistent. There's nothing wrong with either choice. Downloaded it again so I can endorse it as soon as the 15 minutes are up. Great work! 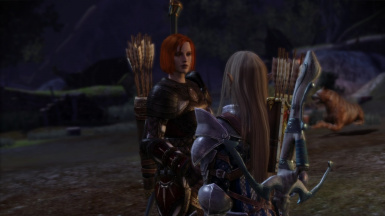 I love me some pretty-but-not-over-the-top Leliana.